...Yet such are Aeurtum's strengths that they're easy to ignore once the doom-filled swing of the song begins, led by vocals that are dominated by gravelly growls but backed by very subtle whispers that makes for an eerie unison. Band mastermind Jonathan Collins is clearly a guitarist first and foremost, as the reliance on beautiful lead playing shows, but the rhythm section makes for a solid backup, even if an artificial one. And by the time the song kicks into a faster gear at the end, it's like some strange new variety of black metal, melodic yet strange and otherworldly – a trick repeated on later interlude Burrow. Aeurtum is at its best when it's most atmospheric, and fortunately this is much of the album. Although some songs seem to be repeating ideas rather than forming new ones, the overall effect is splendid; even the frequent dips into snail-paced melodic interludes that would hold other bands back are used to good effect here, emphasising the doomy moments. And when the band does up the tempo and explore melodic death terrain to a greater degree, as on Within the Ashes of the Deadwood, it feels right enough not to detract from the slower moments. It does seem to be the slower, introspective moments where Aeurtum excels, however, and it's a relief that the faster parts are restricted. You'd hesitate to even call the band melodic death – this is one of those compellingly hard-to-pigeonhole bands that borrows from several genres yet doesn't belong to any outright. 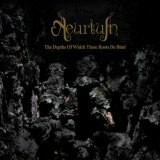 Whatever you call it, The Depths of Which These Roots Do Bind is one of those many excellent metal albums that will be released to little popular acclaim, but which deserves much more.